Heading out of town on US 30 east from Breezewood - go up the mountain and cross over the modern Turnpike on an overpass. Continue up the hill and watch for PA 915 North, which will join up with US 30 briefly and then turn off to your left. with a road to your right. Take this road to your right and follow it down the mountain -- soon you will be paralleling the modern turnpike on the northern side. At the base of the descent -- you will come to a 4 way intersection with the worker entrance to the existing PA Turnpike service plaza ahead of you and a road passing underneath the existing turnpike to your right. Make a right here and proceed under the turnpike -- headed south. About a mile later, the road will come to a four way intersection -- with the primary direction of travel turning off to the left -- you want to continue straight - going onto 'Pumping Station Road'. Follow this road for about 1.5 miles until you come down a small hill and see an overpass - this is the old Turnpike. Make a right on what appears to be a small driveway just before reaching the underpass -- this was the access road to the old Cove Valley Service Area. Continue up the driveway until you reach a jersey barrier that has 'no vehicles' stenciled in orange day-glo paint on the top. Park here and take your bikes around the barriers and continue up for about a 1/2 mile or so. You will come into the old service area - which later served as a firing range for the State Police (don't worry, it has long been inactive, despite the warnings still posted). 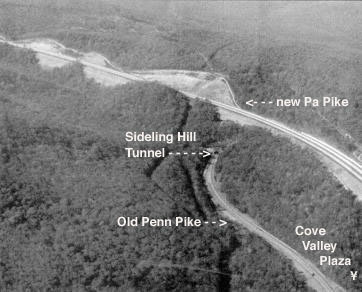 You will find the Sideling Hill Tunnel about 2 miles north of Cove Valley on a very gentle, if roughly paved incline.